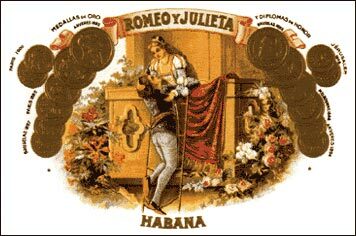 The "Romeo and Julieta" brand was developed in 1875 by Inocencio Alvarez and Mannin Garcia who gave it the name of William Shakespeare's tragedy written circa 1596. It won gold medals in four universal expositions between 1885 and 1900. So, the highest quality of these cigars was proven. In 1903 the brand was acquired by Jose Rodriguez Fernandez, known as "Pepin." The "Churchill" shape was introduced in honor of the British statesman Winston Churchill. The name of the factory shape for this size is the "Julieta 2". Fernandez brought the production of cigars to a new level. His factory "Arguelles y Cia" produced upward of 2,000 different cigar bands, personalized for their very best customers. Jose Rodriguez Fernandez died in 1854 at the age of 88. He promoted his brand with endless energy all his life and his efforts were not lost. The full-flavored "Romeo and Julieta" brand became very popular all around the world and it is traditionally credited by the smokers.